As far as food trends go, “eating the rainbow” is nothing new. Since long before the Instagram-propelled advent of tie-dye bagels and other “unicorn” treats, people have espoused colorful eating—but in the form of whole, naturally vibrant fruits and vegetables. That’s the idea behind food journalist Kat Odell’s new “Unicorn Food” cookbook. The book steers away from glitter and food coloring to highlight the healthier side of the trend, with a kaleidoscopic collection of pretty, plant-based recipes that get rainbow hues from all-natural ingredients. 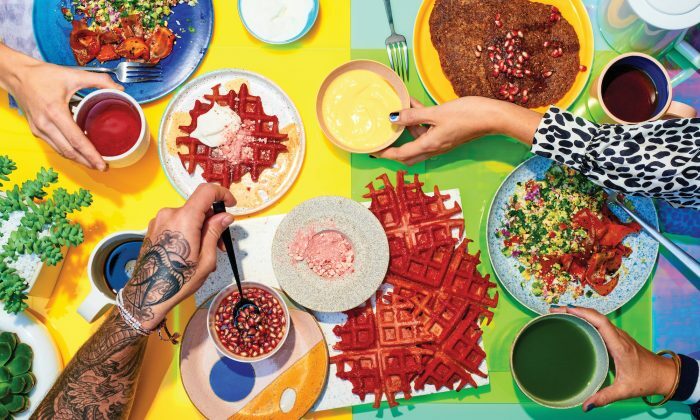 Grain bowls and tacos are studded with roasted veggies; waffles are dyed crimson with beet puree; and homemade nut milks are tinted pastel with the likes of turmeric, matcha, and Blue Majik algae powder. With nature’s palette, Odell crafts colorful dishes from salads and soups to probiotic breakfast custards and raw desserts. Playful and packed with nutrients, her creations are as gorgeous as they are good for you. These dark pink, tie-dye waffles get their vibrant color from beets, which are rich in antioxidants and channel a sweet, earthy flavor. Chinese five-spice powder—a fragrant mix made from a combination of cinnamon, star anise, fennel, Sichuan pepper, and cloves—adds a subtly exotic taste to the beet batter, and both of those flavors pair well with the strawberry dust that’s sprinkled atop. When making these waffles, I like to leave the outer inch or so of the waffle iron empty, only filling the center—when you close the iron, the batter spills out asymmetrically, creating a lacy, organic shape. Combine 1 cup of the rice flour, 1 chia egg, 1 cup of the hazelnut milk, 4 tablespoons of the beet puree, 1 tablespoon of the coconut oil, 1 tablespoon of the coconut palm sugar, the Chinese five-spice powder, 1 teaspoon of the vanilla, 1/2 teaspoon of the baking powder, and 1/8 teaspoon of the salt in a medium bowl and whisk to blend into a dark pink batter. In a second medium bowl, combine the remaining 1 cup rice flour, 1 chia egg, 1 cup hazelnut milk, 1 1/2 teaspoons beet puree, 1 tablespoon coconut oil, 1 tablespoon coconut palm sugar, 1 teaspoon vanilla, 1/2 teaspoon baking powder, and 1/8 teaspoon salt and whisk to blend into a light pink batter. Grease the waffle iron on top and bottom with coconut oil and heat the iron according to the manufacturer’s directions. Ladle about 1/4 cup or more of the dark pink batter onto the waffle iron, dropping small amounts haphazardly into the center of the iron and leaving some gaps in between. Fill in the gaps with about 1/4 cup or more of the light pink batter (leave the outer inch or so of the waffle iron bare) so you have an organically shaped circle of batter in the center of the iron. Close the iron and cook the waffle until light brown and crisp on the outside, about 9 minutes, depending on your waffle iron. Carefully remove the waffle from the iron, transfer it to a plate, and cover with aluminum foil to keep warm. Repeat with the remaining batters (it should make 3 waffles). Serve the waffles warm, topping each with 2 tablespoons of coconut whip and a sprinkling of the tutti-frutti dust. Fill a medium pot halfway with tap water and add the beet. Bring to a boil over medium-high heat, then lower the heat to medium and simmer until the beet is soft when pierced with a fork, about 30 minutes. Remove the beet from the water with a slotted spoon and set aside to cool to room temperature. Using your hands, slip the skin off the cooled beet (it will come off easily). Transfer the beet to a food processor and blend until the beet is pureed, about 20 seconds. If needed, add water, a teaspoon at a time, until a puree forms. Beet Puree will keep, covered in the refrigerator, for up to 5 days. Open the can of coconut milk; the thick coconut cream sits at the top and the coconut water below it. Using a spoon, scoop out the cream and transfer it to the bowl of a stand mixer fitted with the whisk attachment (or into a large bowl, if using an electric hand mixer); reserve the coconut water for another use. Add the vanilla, coconut palm sugar, and salt, and whisk together on high speed until the mixture resembles whipped cream, about 1 minute. Serve immediately. Combine the freeze-dried fruit in a Ziplock bag and seal the bag. Roll a wine bottle, jar, or even a rolling pin over the bag to coarsely crush the fruit. The dust should be mostly powder, with some larger chunks. Tutti-Frutti Dust will keep, in an airtight container at room temperature, for 1 month. Excerpted from “Unicorn Food: Beautiful Plant-Based Recipes to Nurture Your Inner Magical Beast” by Kat Odell (Workman Publishing). Copyright © 2018. Photographs by AJ Meeker. 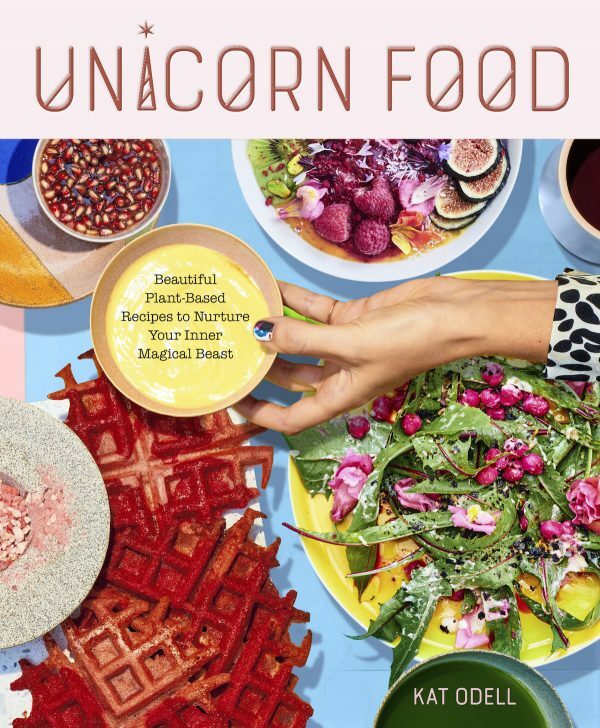 “Unicorn Food: Beautiful Plant-Based Recipes to Nurture Your Inner Magical Beast” by Kat Odell ($19.95).